We hope you will stop by to visit us at the Wellfleet Oysterfest this weekend. Our booth will be located next to the oyster shell recycling roll-off. In addition to slurping down some delicious oysters, there are other excellent foods including classic chowder and fried lobster tail. 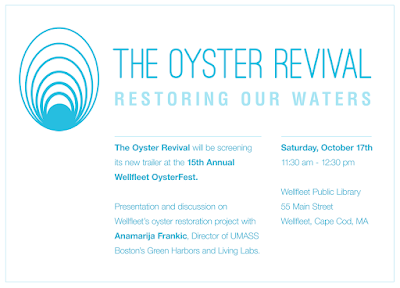 In addition to feeding your stomach, you can feed your mind by attending a preview of The Oyster Revival at the Wellfleet Public Library on Saturday at 11:30 am. Mass Oyster has been watching this project since it's infancy and we are excited to see it coming to fruition.